For the stabilisation of hyperthyroidism in cats prior to surgical thyroidectomy. For the long term treatment of feline hyperthyroidism. For the stabilisation of hyperthyroidism in cats prior to surgical thyroidectomy. For the long term treatment of feline hyperthyroidism. The product should be administered directly into the mouth of the cat. Do not administer in food as efficacy of the product when administered via this route has not been established. The total daily dose should be divided into two and administered morning and evening. In order to enhance stabilisation of the hyperthyroid patient the same dosing schedule relative to feeding should be used daily. Haematology, biochemistry and serum total T4 should be assessed before initiating treatment and after 3 weeks, 6 weeks, 10 weeks, 20 weeks, and thereafter every 3 months. At each of the recommended monitoring intervals, the dose should be titrated to effect according to the total T4 and to clinical response to treatment. Standard dose adjustments should be made in increments of 2.5 mg (0.5 ml) and the aim should be to achieve the lowest possible dose rate. In cats that require particularly small dose adjustments, increments of 1.25 mg (0.25 ml) can be used. If total T4 concentration drops below the lower end of the reference interval, and particularly if the cat is showing clinical signs of iatrogenic hypothyroidism (e.g. lethargy, inappetence, weight gain and/or dermatological signs such as alopecia and dry skin), consideration should be given to reducing the daily dosage and/or dosing frequency. The dose administered should not exceed 20 mg per day. For long-term treatment of hyperthyroidism, the animal should be treated for life. Do not use in pregnant or lactating females. Please refer to section 4.7 of the SPC. Please refer to section 4.9 of the SPC for monitoring instructions. People with known hypersensitivity (allergy) to thiamazole or one of the excipients should avoid contact with the veterinary medicinal product. If allergic symptoms develop, such as a skin rash, swelling of the face, lips or eyes or difficulty in breathing, you should seek medical attention immediately and show the package leaflet or label to the doctor. Thiamazole may cause gastrointestinal disturbances, headache, fever, joint pain, pruritus (itching) and pancytopaenia (decrease in blood cells and platelets). Avoid dermal and oral exposure, including hand-to-mouth contact. Do not eat, drink or smoke while handling the product or used litter. Wash hands with soap and water after administration of the product and handling the vomit of or litter used by treated animals. Wash any spillages from skin immediately. Following administration of the product any residual product remaining on the tip of the dosing syringe should be wiped clean with a tissue. The contaminated tissue should be immediately disposed of. The used syringe should be stored with the product in the original carton. This product may cause eye irritation. Avoid eye contact including hand to eye contact. In case of accidental eye contact, rinse eyes immediately with clean running water. If irritation develops, seek medical advice. As thiamazole is a suspected human teratogen, women of child-bearing age must wear non-permeable single use gloves when administering the product or handling the litter/vomit of treated cats. If you are pregnant, think you may be pregnant or are attempting to conceive, you should not administer the product or handle the litter/vomit of treated cats. An off-white to light yellow opaque solution. In order to enhance stabilisation of the hyperthyroid patient the same feeding and dosing schedule should be used daily. Adverse reactions are uncommon. The most common clinical side effects that are reported include vomiting, inappetence/anorexia, lethargy, severe pruritus and excoriations of the head and neck, bleeding diathesis and icterus associated with hepatopathy, and haematological abnormalities (eosinophilia, lymphocytosis, neutropenia, lymphopenia, slight leucopenia, agranulocytosis, thrombocytopenia or haemolytic anaemia). These side effects resolve within 7 – 45 days after cessation of thiamazole therapy. Possible immunological side effects include anaemia, with rare side effects including thrombocytopenia and serum anti-nuclear antibodies, and, very rarely, lymphadenopathy can occur. Treatment should be stopped immediately and alternative therapy considered following a suitable period of recovery. Laboratory studies in rats and mice have shown evidence of teratogenic and embryotoxic effects of thiamazole. In cats, the safety of the veterinary medicinal product has not been established during pregnancy or lactation. Do not use in pregnant or lactating females. In tolerance studies in young healthy cats, the following dose-related clinical signs occurred at doses of up to 30 mg thiamazole/animal/day: anorexia, vomiting, lethargy, pruritus and haematological and biochemical abnormalities such as neutropenia, lymphopenia, reduced serum potassium and phosphorus levels, increased magnesium and creatinine levels and the occurrence of anti-nuclear antibodies. At a dose of 30 mg thiamazole /day some cats showed signs of haemolytic anaemia and severe clinical deterioration. Some of these signs may also occur in hyperthyroid cats treated at doses of up to 20 mg thiamazole per day. Excessive doses in hyperthyroid cats may result in signs of hypothyroidism. This is however unlikely, as hypothyroidism is usually corrected by negative feedback mechanisms. If overdose occurs, stop treatment and give symptomatic and supportive care. Following oral dosing with the product in healthy cats, at a dose rate of 5 mg, thiamazole is rapidly and completely absorbed. Elimination of the drug from cat plasma is rapid with a half-life of 4.35 hours. The time of peak plasma levels occur 1.14 hours after dosing. Cmax is 1.13 µg/ml. In rats thiamazole has been shown to be poorly bound to plasma protein (5%); 40% was bound to red blood cells. The metabolism of thiamazole in cats has not been investigated, however, in rats thiamazole is rapidly metabolised in the thyroid gland. About 64% of the administered dose being eliminated in the urine and only 7.8% excreted in faeces. This is in contrast with man where the liver is important for the metabolic degradation of the compound. The drug residence time in the thyroid gland is assumed to be longer than in the plasma. In the absence of compatibility studies this veterinary medicinal product must not be mixed with other veterinary medicinal products. Shelf life after first opening the container: 6 months. 30 ml and 100 ml presentations filled into amber polyethylene terephthalate (PET) screw bottles with HDPE/LDPE child resistant caps. The product is supplied with a 1 ml polyethylene/polypropylene measuring syringe. The syringe is graduated in 0.25 ml increments up to 1 ml. 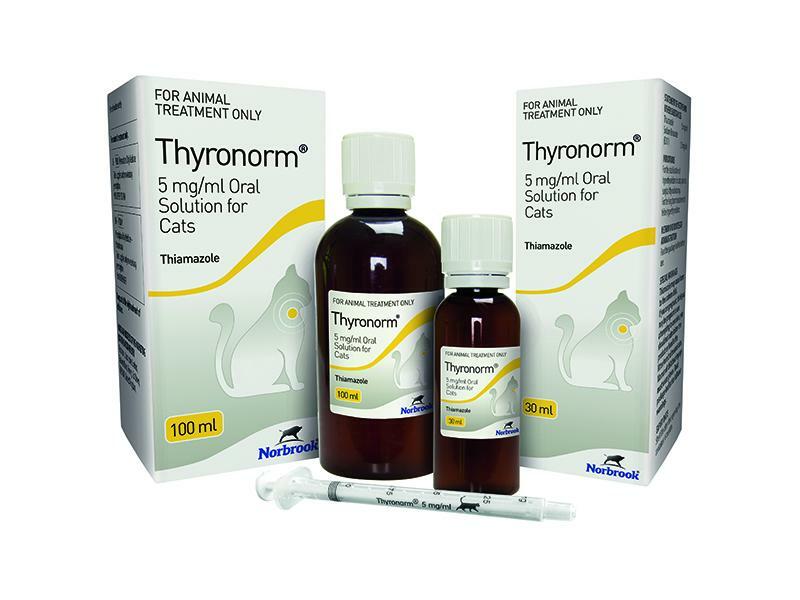 Below are some recent questions we've received regarding Thyronorm 5 mg/ml Oral Solution for Cats, including answers from our team. My 16 boy cat has been on the gel that you put in his ears but now due to the cost of his treatment my vet has suggested this. He doesn't do pill. The product should be used within 6 months of opening and not beyond the expiry date. How do I get a prescription to you?